These high-quality tables by COSCO cater to any occasion. Dress them up for the holidays or take them outside for a barbecue. 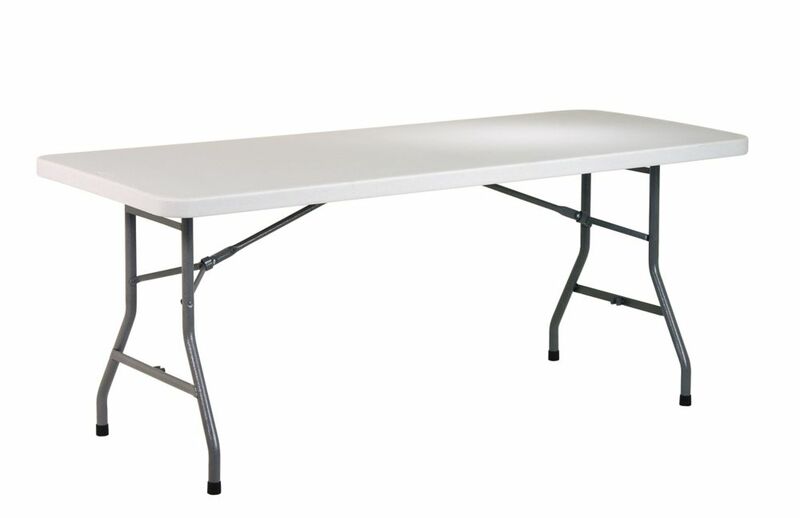 The 6' White Centerfold Blow Molded Table features a waterproof top that resist spills and weather. This versatile piece saves space and time with table legs that fold in and a center folding feature that makes transport and storage virtually effortless! Its rectangular length provides additional seating at both ends of table! Table has a heavy duty strong steel frame, steel legs, and a low maintenance, sturdy easy to clean top. The Folding Card Table and Chair Set is a convenient solution for times when you have more guests than table settings.The 5 piece set includes 4 metal folding chairs with vinyl seats and backs and a square folding table with a padded, vinyl cover. An attractive, powder coated finish on the table and chair legs protects them from scratches. Plastic floor glides protect your floor by sliding smoothly when you need to move the set. It can be used indoors or outside and is lightweight and easy to fold up, transport and store.This classic set comes in handy when you need additional table settings for family get-togethers or for poker night in the man cave. This table is a super Tough Blow moulded polyethylene top that won't crack, peel chip or stain. It is great for both indoors & outdoors usage, it can be at home, office, for parties or even in the garage. It has a high quality Powder-coated steel frame that is strong and weather resistant. It is easily portable and has some nice additional features that include : Red Lever Lock, Interlocking Table Top Design, Nylon Carry Handle and Latch-Free Storage. The Lifetime square card table builds on a classic design, improving on stability, looks, weight, and durability. Lifetime card tables combine the popular folding design with superior durability. So pull up a chair, cut the deck, and bring on the refreshments! The plastic surface is stain resistant and easy to clean, and the steel legs and supports ensure table stability. When the game is over, this lightweight card table folds up quickly and easily for out-of-the-way storage. Like all Lifetime tables and chairs, the Lifetime card table is constructed of only the best, high-quality materials: UV-protected high-density polyethylene (HDPE) plastic with a honeycombed tack-off design for extra rigidity and powder-coated steel for indoor and outdoor use. You don't have to worry about rusting, cracking, or peeling with a Lifetime card table. 6 ft. Resin Multipurpose Table with Folding Legs Perfect for when the occasional need for an extra table pops up, this 6 foot long resin multipurpose table is both light weight and durably constructed with a sleek design. The tables legs can folded down for easy storage and is ideal for both indoor or outdoor use with its power coated tubular frame and 45mm thick top. 6 ft. Resin Multipurpose Table with Folding Legs is rated 4.8 out of 5 by 5. Rated 5 out of 5 by Higherpath from Light but durable Easy setup and easy to pack around yet durable. Used for a wedding last weekend.